This is Part Two of a Two Part Interview. You can check out Part One here. OR: Tangledeep is currently out on Steam and the Nintendo Switch. 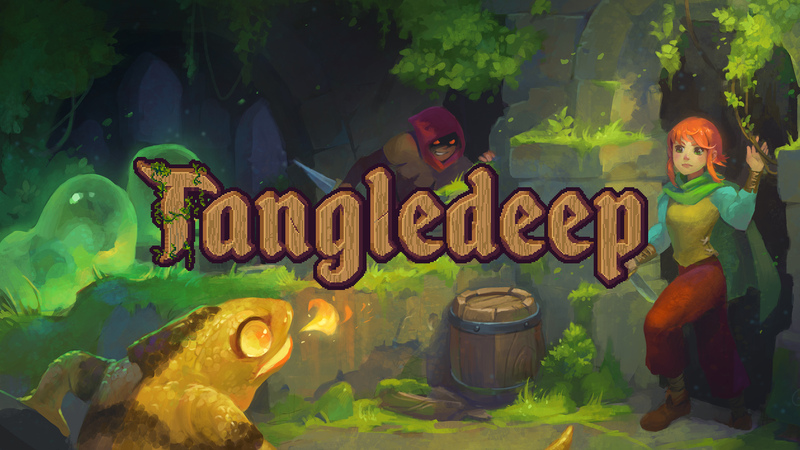 Do you have any plans to bring Tangledeep to the Xbox? AV: At the moment, I actually have an Xbox One development kit in the house. I have two, as a matter of fact. But the Switch port was surprisingly- it was easier in some ways. It was easy to get the game just running on the Switch. But it was a bit difficult to get it optimized and feeling as good as possible for console. Because it started as a PC game, where you’re expected to have a mouse and a keyboard. It’s not a simple game, necessarily, where it’s just a couple of buttons. There’s all kinds of keyboard shortcuts [and] things you can hover over. So adapting it to the Nintendo Switch took awhile. Now, what I talked about with the programmer that did the Switch port was [that] a lot of the work that we did on the Switch port would benefit other consoles as well. It would benefit PlayStation, Xbox, because fundamentally, those controllers aren’t that different from the number of buttons on the Joy-Con or a Switch Pro Controller. That being said, we’ve also had a lot of requests for a mobile version. For example, iPad or something like that. Possibly even phone. So I would personally [be] more towards putting resources into a mobile port, because there’s a lack of really great rogue-like for mobile. There’s a handful, but there aren’t that many. A lot of them are just very, very, very, very simple. And to me, not that interesting. Obviously, not all of them are like that. A great one would be Sparingwood. So I think we’ll just get mobile next. OR: Donald M. Murray once wrote: “All my writing – and yours- is autobiographical.” What of yourself do you see in Tangledeep? AV: That’s a good quote, wow. *laughs* That’s interesting. I mean, in a way, the world of Tangledeep reflects, I guess, a more optimistic view of things. I grew up watching shows like Star Trek, which is- without speaking to the newest one, which I have not seen too much of- Star Trek is a very optimistic show in the sense of ‘this is what the future could be like.’ And I loved reading science fiction. Again, what could a possible future be like? And even though [Tangledeep] isn’t a science fiction game, exactly – trying to craft a world where there’s a sense of positivity, that you’re somebody who is trying to do the right thing for the world. You’re trying to bring knowledge to the people of the Underground. You start in the Underground with basically no knowledge of the surface, NPCs that are – they have quirky personalities, but they’re friendly. They’re people that you’re fighting for through your adventure. It might sound a little corny and cheesy, but it’s that sort of heart that reflects the way that I’m optimistic ultimately, or idealistic about how I want things to be. There certainly is a time and a place for games like Diablo, which is the polar opposite. I love Diablo. But, now and again, sometimes, it is nice to have a game where you’re fighting for something positive, and you are positive. And there’s not as much core dismemberment, death, and sadness and misery. OR: Earlier [OR Note: In Part One] you mentioned Tolkien. How did he inspire your work? AV: I guess there is something that anybody making anything fantasy in the video game realm- we owe something to him, just because he was just a fine crafter of worlds [and] that he had so many amazing ideas. Of course, I read The Hobbit and The Lord of the Rings growing up, as so many other people did. And so I think you see some things that are- not in terms of specific creatures or story elements in Tangledeep– but more like the idea of world-building and trying to create something. That is something that I think ultimately he was unparalleled at, putting all that time in creating a world with consistent rules, with a background. I tried to do the same thing with Tangledeep. Where even if, story-wise, everything that I thought of and wrote down didn’t make it into the game version 1.0, more of it will show up in Legend of Shara. I tried to do that world-building before writing the story, and kind of taking that influence [instead] of taking it as a series of events that happened to a bunch of characters. I tried to do what he did, to build a lore, a setting. ‘What are the elements of the world? What are the magics of the world? How does it work? What are the races of the world? What are their relationships?’ And then go from there. OR: You mentioned earlier that you had been composing for fifteen years. You’ve done titles such as Impulse Prime, Unearthed, Phineas and Ferb: Across the 2nd Dimension, and I believe you were involved in Super Street Fighter II Turbo HD Remix, and Monkey Island 2 [: LeChuck’s Revenge Special Edition]. AV: Yes, those are some of the things that I’ve worked upon. OR: How did your prior musical experiences influence the music for Tangledeep? AV: I basically took everything that I practiced and learned and applied it to this game. To me, if not the very best thing I’ve written as a musician, it’s at least tied- because I’ve done different styles of music, it’s hard to say if one completely different style is better than this- but part of why I became a composer was listening to video game music, especially the amazing work of composer Yasunori Mitsuda on Chrono Trigger and Xenogears. And [Nobuo] Uematsu – the heavy hitters of the JRPG world. But even titles for the NES as well. The Mega Man games, Castlevania, things like that. I tried to sort of integrate what I’ve learned listening to and studying that music, as well as arrangement and writing. Bringing new ideas and not just rehashing and trying to do exactly what they did. So yeah, I think its kind of a culmination of all that. With hotbars, weapons, frogs, and a 16-bit era inspired soundtrack, Tangledeep definitely could have come out of the SNES-era. (Image courtesy of Impact Gameworks). OR: How do you compose? What is your setup like? How do you build music for Tangledeep? AV: This game was a little unique, because I wanted to capture the aesthetic of Super Nintendo soundtracks, which is something that, surprisingly, is not that common. There are a lot of video game soundtracks that go for a very modern sound, very cinematic film score-esque. There are plenty of games that have a distinctly retro Nintendo/Famicon/NES-kind of sound. But what I wanted to do was to get one generation past that. And so the process involved using a tool that I was involved in the creation of, called Super Audio Cart, that allows you to reproduce basically authentic Super Nintendo-style sounds and instruments. And so for every track, I had the same palette of sounds. There were a couple dozen instruments, rather than having ten terrabytes of instruments. I know plenty of excellent musicians that could have recorded live parts. Violin, voice, flutes, and all that. But I wanted to use the same palette of very very small samples to try to have the same consistency and limitations that a composer might have had in the Super Nintendo era. And so I would start with that palette. It really inspires creativity when you have your set of sounds, and you don’t have to worry about what other sounds you’re going to use or crafting the perfect things. That’s your palette, that’s what you have. No more, no less. And then, usually, I improvise at the keyboard until I find ideas that I like in terms of melodies and chords and harmonies. And then once I find that idea, usually within three or four sessions of composing, maybe two to four hours each, I would have a complete piece of music. 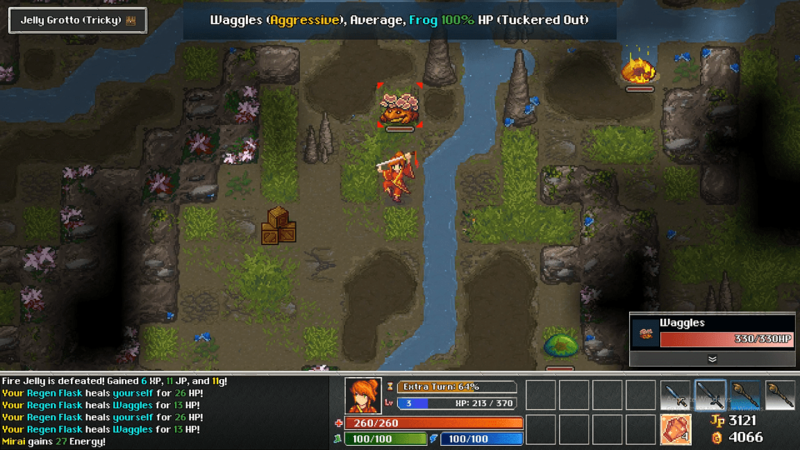 OR: Was Tangledeep easy to compose for? AV: I would say…yes. Because its my game. *laughs* So I had total creative freedom in terms of what exact approach I wanted to take, [though] I just said that I was limiting myself in terms of the sounds. It’s nice to be your own boss when it comes to that. It can be demotivating if you’re working as a freelance composer for a project, and you want to do one thing but who you’re working for wants you to do a different style that you don’t like as much or that is not as inspiring. Also, having such an understanding of the game, being the one that created it, made it easy to get the right emotions into each piece. I think I ended up writing thirty tracks or something like that. I don’t remember the exact count. And there’s even more in the expansion. I’ve greatly enjoyed composing the soundtrack. OR: So. Why so many frogs? AV: Why so many frogs. *laughs* Good question. So I don’t know at what point frogs became the symbol of Tangledeep. I think it is because, I remember, I had described a frog enemy to the character artist, and the sprite that he drew was just so funny to me, it had just so much personality to it – like the animation of just puffing up- that I kept asking him for more things like that. Like, ‘Let’s make a gold version of that, called Gold Frog.’ That somehow, everybody loved that. So once we had that frog in the game, once we had the gold version in the game, people wanted emoticons on Discord for that, they wanted avatars based on the frogs. And I said “Well, okay. I guess we’re gonna make more frogs then.” *laughs* So it just went from there. 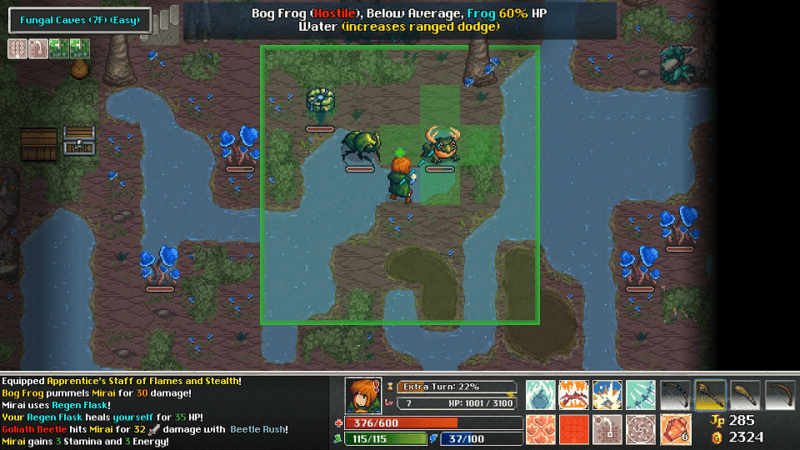 Frogs (as pictured here) are the ‘symbol’ of Tangledeep. (Image courtesy of Impact Gameworks).